Keeping Up With the Kapenga's: Our cute little "poser"
For such a little girl she has a HUGE personality and I just love it. Here are a couple of her three year pictures....it was hard to choose which ones to post. I laugh everyday at the funny things she comes up with. 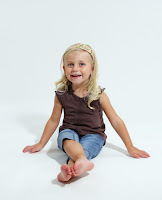 Tracy did a great job trying to capture our little "poser"....she loves the camera! It is frightening (in a good way) how much she looks like you at that age! Not Much Laboring Over Labor Day!